In response to President Barack Obama’s announcement on December 1 to deploy 30,000 additional troops to the occupation of Afghanistan, the organization March Forward!, with comprising both veterans and active-duty members of the US military, has called on all soldiers to refuse their orders to deploy. 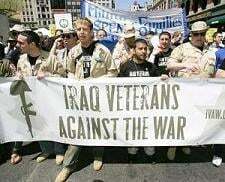 Michael Prysner, a former corporal in the Army who served from 2001-2005 and a veteran of the occupation of Iraq, co-founded the group with another Iraq war veteran, James Circello. Truthout asked Prysner how he responds to those who believe a soldier should always follow orders, no matter what. In April 2007, Circello left his base in Vicenza, Italy, and went absent without leave (AWOL) in protest of US policy in the Middle East. In November 2007, he turned himself in to the military at Fort Knox and was discharged within three days. Circello has remained very active with his work against US Foreign Policy, having worked with Iraq Veterans Against the War and the group Courage to Resist before joining March Forward!. Circello’s decision to go AWOL was his way of refusing to deploy to Afghanistan. According to Pentagon figures, since October 2001, more than 50,000 soldiers from all branches of the military have gone AWOL. John Raughter is the communications director for the American Legion, an organization that describes itself as “a patriotic, war-time veterans organization, devoted to mutual helpfulness,” according to its web site. In addition, Article I, Section 8, Clause 11 (the war powers clause) of the US Constitution authorizes only both houses of Congress, not the president, to declare war. Nonetheless, that process has been followed only five times in our history and last used on December 8, 1941, after Japan attacked Pearl Harbor. Circello’s response to those who refer to their tactic of encouraging soldiers to refuse deployment orders as being “unpatriotic or un-American? Prysner and Circello’s organization has stated, “March Forward! supports the right of all service members to refuse illegal and immoral orders. Orders to deploy to Afghanistan and Iraq are just that: illegal and immoral. We have no reason to fight in these wars, and we have every right to refuse to be a part of them.